After prayers, the symbolic ring was formed outside the building. NORWEGIAN MUSLIMS ORGANISED a peace vigil in Oslo yesterday in a show of solidarity with Jews, a week after fatal shootings in Denmark targeted a synagogue and free speech seminar. Working against fear alone is difficult and it is good that we are so many here together today. There was a heavy police presence at the event, and sharp shooters placed on surrounding buildings, but no incidents were reported. Several Muslim speakers said that Islam was a religion of peace and that “its true face” had nothing to do with terrorism — despite what they said was unfair reporting in certain Nordic media which portrayed Muslims “as a problem”. 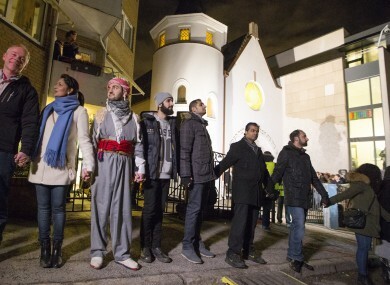 Email “Muslims form 'human shield' around Oslo synagogue ”. Feedback on “Muslims form 'human shield' around Oslo synagogue ”.